FreeNX is een pakket met shellscripts dat is gecombineerd met de onder GPL vrijgegeven NX kernbibliotheken van NoMachine. NX is a remote access protocol. It is both fast, secure, graphical and open (as opposed to the Telnet protocol, which is only fast and open). NX is basically a client-server protocol, that allows you to graphically access any machine, It is based on both (open)SSH (for security) and X Compression (for GUI and speed), and NX is much easier to use than normal X protocol. Alows you to connect remotely to your desktop, over a secure channel. Works well over slow and high latency connections. Supports clipboard actions between your local and remote system. Supports local printing from the remote applications. After NoMachine created NX a few years ago, they released their core libs and commandline tools to the public (as GPL). Kurt Pfeifle - a KDE contributor - took those libs and tools and created a first humble (unreleased) script that automated the setting up of a remote NX connection to a degree. 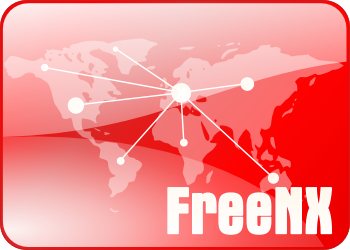 After Kurt introduced Fabian Franz (at the time a contributor to Knoppix and MPlayer) to NX, Fabian created a project called FreeNX; FreeNX is a work-alike implementation of NoMachine's commercial (and closed source) NX Server. NoMachine still releases their core libraries under GPL, gives away their NX Client and grants free binary redistribution rights for it. Their client can be used to access FreeNX servers. We - the community - can use the GPL'ed implementation of the FreeNX server and the KDE "knx" client (though that one does still miss many features and lacks maintenance). There's also the GPL-ed client for the 2X server (another commercial product by a different company that uses the NX core libs) that is supposed to work with FreeNX. Deze pagina is het laatst bewerkt op 8 okt 2010 om 16:23. Deze pagina is 3.010 keer bekeken.